Lyjon Construction provides new build, project management, design & build, refurbishment and planned maintenance contracts to as large variety of clients including Knowlsey Housing Trust, Cheshire West, and Cheshire Council, Alpha Housing, Georgia Pacific, GrowHow and Mersey Tunnels. Established in 1964 and committed to quality and high levels of customer service has enabled us to obtain and retain clients from the beginning setting us apart from our competitors. Your project will be managed by a professional and responsible contractor with ISO 9001, ISO 14001 and OHSAS 18001 accreditations. To deliver customer satisfaction to the highest standards of quality and to be the preferable building and civil contractor of choice. Maintain and continually improve an ‘Occupational Health & Safety Management System’ that meets the requirements of OHSAS 18001:1999. Maintain and continually improve an ‘Environmental Management System’ which meets the requirements of BS EN ISO 14001:1996. Download our company profile, this describes more about us, details our insurance details, company information and project track record. 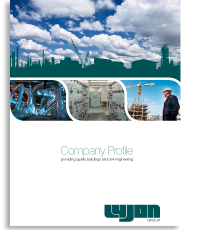 Please complete the following to access your free copy of Lyjon’s Company Profile 2014.